Still cold…still viable comfort food weather! Step1: So as we’re using shin beef here we gotta do a little cooking before the pie is made – treat this then like a stew or casserole. Kick off by creating a dredge using the flour and mustard powder. 4 tbs flour to 1 tbs mustard powder along with a generous blast of seasoning. Step2: Chunk the shin beef from the bone and dredge through the mustard mix – keep the bones handy. Step3: Brown the beef in 2 batches – you want a really deep colour and carmelisation to ensure a deep sauce. Step5: Pre-heat the oven to 140c, clip on a tight lid to the pot and sling into the oven for 2 hours or until the beef is falling apart. Next let it cool completely. Step6: To build the pie get your hands on two individual pie dishes, cut out four large circles from the puff pastry using the pie dishes as a guide. One circle for the body and one for the lid, neatly mould one of the pastry circles into the pie dish then scoop in the cold beef filling, brush egg wash around the lip then pop on the lid and crimp well. Step7: Finally brush the pie lids with the remaining egg wash and baked for 35-40 minutes. 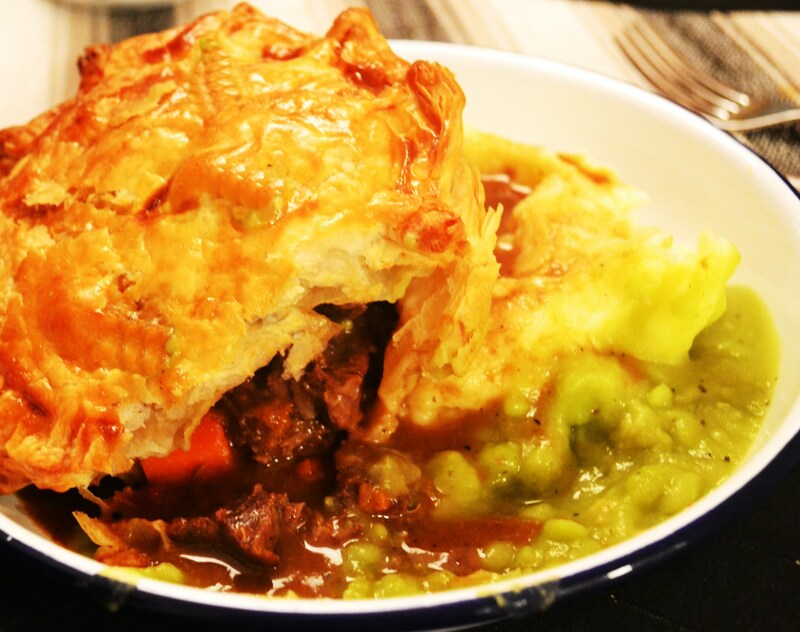 Done deal – serve this beauty with the standard issue mushy peas and gravied mash! I’ve been out on the bike up the mountains these weekends. This is what I would like to return home to. Great pie.